News - Käte Hamburger Kolleg "Recht als Kultur"
A review of the publication „Umkämpftes Recht. Zur mehrdimensionalen Analyse rechtskultureller Konflikte durch die politische Kulturforschung“ by PD. 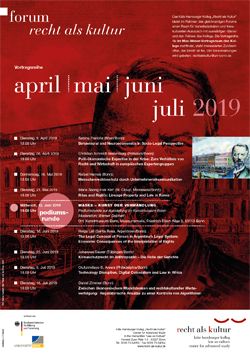 Dr. Jan Christoph Suntrup, former research coordinator and fellow and current affiliate researcher at the Käte Hamburger Center „Law as Culture“, has been published by Prof. Dr. Stephan Rixen in the March 2019 Edition (Issue 5) of the journal JZ (Juristen Zeitung). Prof. Dr. Stephan Rixen is professor of law at the University of Bayreuth. The reviewer highlights the work as an impressive and convincing example of interdisciplinary legal research. Additionally, he argues for using the publication as a fundamental work of legal studies, and, furthermore, to honour it as "legal book of the year“. On Thursday, 07 March 2019 (11.00 - 11:45) Theresa Strombach and founding director Prof. Dr. jur. Dr. h.c. Werner Gephart, will speak at the workshop "Legal communication in a multilingual and multicultural context" on the topic: "Legal Communication in the Light of the Law-as-Culture Paradigm". The workshop will be conducted by the Center for Interdisciplinary Language Research (ZefiS), Bergische Universität Wuppertal (further information). Through its homonymous forum, the Käte Hamburger Center for Advanced Study in the Humanities “Law as Culture” offers a space for interdisciplinary and intercultural exchange with international guests and fellows at the Center. The forum events normally take place on Tuesdays in the Center's Max Weber Lecture Room and are open to the interested public. Admission is free. The current program of April until July 2019 can be accessed here (PDF). We kindly ask that you register prior to the event. Further information can be found in the workshop invitation. Podicum discussion "The flâneur as a sociological figure of the modern age"
An inviation card for the podicum discussion "The flâneur as a sociological figure of the modern age" on January 13th, 2019, is now available (pdf, german). Further information can be found here.